Swimsuit model Chrissy Teigen on food, her fiance John Legend, and partnering up with Venus & Olay! Ok, I’m not sure how this will sound but it’s the truth: When I walked into Townhouse Spa last week for the launch of the new Venus & Olay razor, I’m pretty sure I stopped mid-sentence while talking to my friend, Valeria, when I caught sight of the disarmingly beautiful Chrissy Teigen to comment as follows: “Woah. Her legs are out of control.” Clearly, it’s not hard to see why the brand decided to partner up with the Sports Illustrated model on their revolutionary new razor. But more than that, Teigen is just as much a guy’s dream girl as much as she’s a girl’s girl, I learned from talking to her. She makes you feel instantly comfortable, and not to mention, leaves you laughing uncontrollably — the girl is hilarious! Me with Chrissy Teigen. I need to really stop taking pictures next to models. Teigen added that she has to control herself from holding the razor up to her nose every time she has it in her hand (“it smells like crème brûlée!” she exclaimed…an analogy I would totally expect from a food-obsessed cook like herself! Case in point: she says her next dream collaboration would be for a burger commercial!). Beauty and the Feast: I love that you’re a foodie, and I’m really obsessed with your blog! 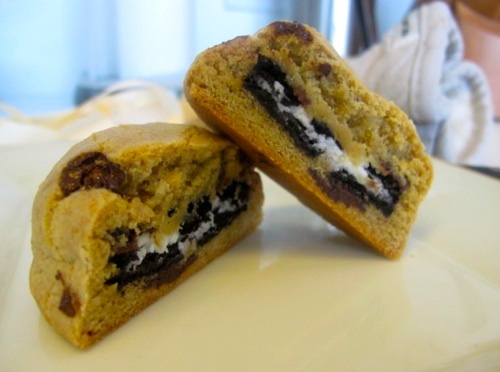 BATF: The oreo-cookies stuffed chocolate chip cookies?! That was genius! Teigen: It’s funny, I’m actually not a sweets person at all. I didn’t think men would be either, but I made those cookies for a bunch of dudes watching football and they like, lost it! BATF: Where did your interest in food stem from? Teigen: It started in highschool. The dream was to go to culinary school, but it was so expensive, like $50,000 per semester. My dad was retiring at the time, and I didn’t want to be a burden on anybody to pay for that, especially if I wasn’t going to be a chef. I never had dreams of being a chef, I just wanted to learn how to cook. I’m so blessed to have the lifestyle where I get to travel so much, but it’s SO nice to be at home where I’m comfortable in my own kitchen. Whereas my days revolve around being insecure or being mad about something, or sad about something, when I get to actually cook everything goes out the window. It’s like therapy. I’m sure the 10 glasses of wine help too! BATF: I saw that you and your fiancé [John Legend] cook together too! Is he a good cook? Teigen: He’s a really good cook! He’s so great about it and so meticulous that he completely reads everything. Me? I just look over and I’m so messy. And I’m one of those people who needs a clean home or else my mind feels dirty. So, I’ll cook these crazy meals and there’ll be dishes everywhere, and in the morning I hear the faucet on, and I know he’s cleaning. Sweetest. Thing. Ever! So I cook, he cleans. BATF: Was he always a foodie like you? Teigen: He always loved food, but I definitely I think I helped the process a lot. 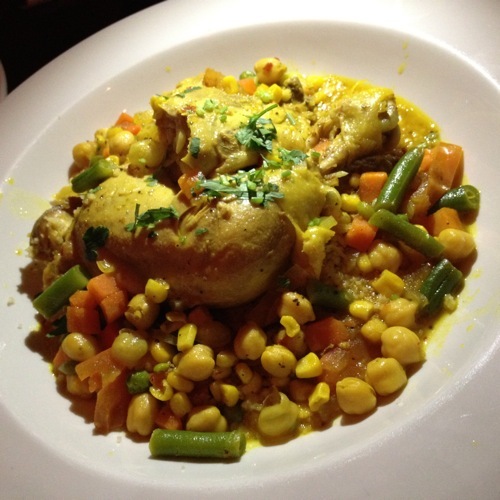 He is obviously in the limelight and he has to stay in shape…and I like making really hearty food. Poor guy has to eat it all, or else I’ll feel bad and make a little pouty face and ask “You don’t like it? ?” So he eats everything. But we’re also pretty obsessed with restaurants. 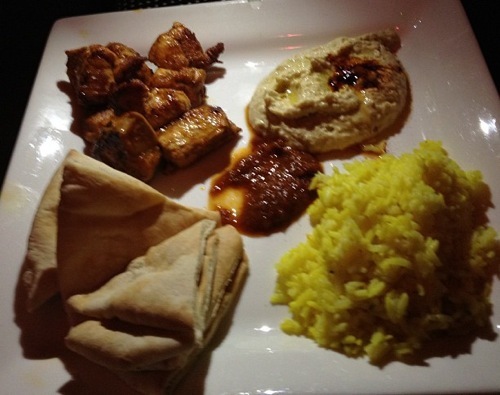 I love having three-hour dinner at a restaurant pretending I’m Padma, critiquing food–but not having any idea what I’m talking about [laughs]. BATF: I can so see you as the next Padma! I’m waiting for your show! 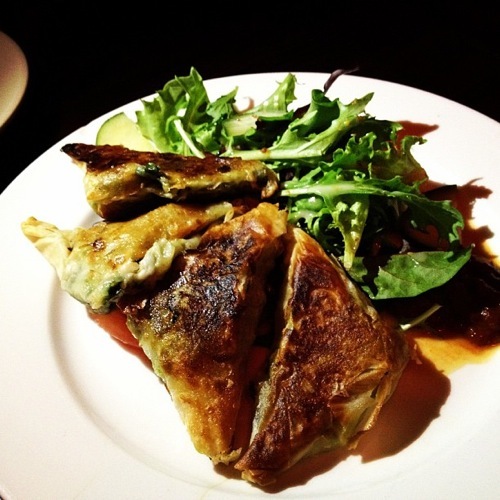 BATF: What are some of your favorite restaurants in the city? Teigen: We live a block from Degustation. Have you been there? BATF: No, I don’t think so. Teigen: Oh my goodness! It’s right on 5th and 2nd Ave., near our place. BATF: Don’t worry I won’t publish where you live. Teigen: Oh it’s ok, everybody knows. My apartment’s for sale. 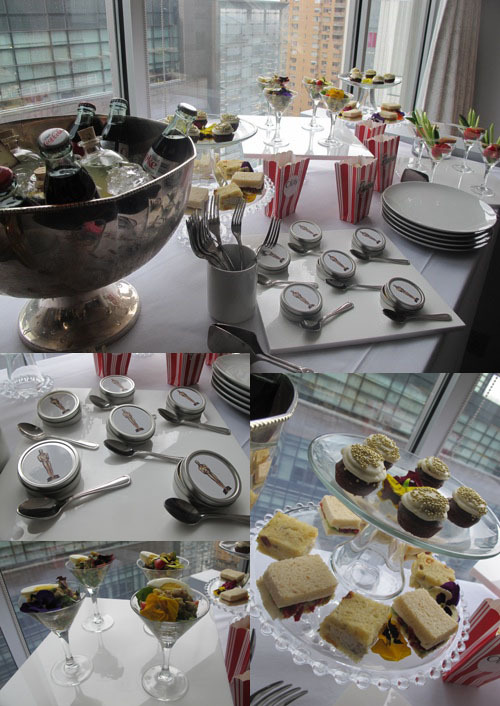 People just come and stare at it, and I’m like, “Hmm…you’re not buying it, are you?” But yeah, Degustation is awesome. 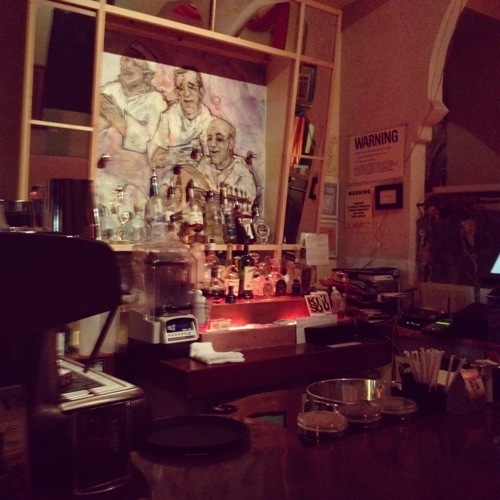 It’s a small little place, there’s only seating at the bar. It’s all tiny bites. We go and get the tasting menu. I think it used to have a famous 20-course menu. Le Bernadin is one of my favorite restaurants in the world, but this place really gives it a run for its money. It’s so weird because you’ll literally have 10 courses, but you’re not full, you just feel great. Everything has such thought and care going into it. They’ll be like, “A truffled scrambled egg set in an egg shell with mousse!” And you take one bite and you’re like, this is amazing! It’s a really awesome place. I also love Pulino’s. I’m always there. I’m like a by-myself-eater. One of the things that’s really cool about New York is you don’t have to feel like a loner. I feel like in LA, if I do that, everyone’s like ‘Eww…nobody likes her.’ But in New York, it’s almost like a confidence thing. BATF: I have to say, I’ve seen a lot of models but holy crap…your legs are really incredible! How do you keep them looking so perfect? Teigen: Nothing is as flawless as it looks. There are [beauty] secrets that go into everything, it’s crazy. If I didn’t have a great tan right now and body makeup, I literally have bruises and the whole thing [Editor’s Note: This is a lie, her legs are gorgeous]. For me, I think I was just lucky with my long legs. Even though my mom’s a petite 5’2, she’s all legs. I’m also obsessed with exfoliating…it doesn’t even have to be scrub, just a washcloth. When I’m shaving, I don’t feel clean without literally wiping my leg after every single stroke. I must feel it. I’m like a freak about it. BATF: What’s your secret to keep your skin glowing? Teigen: I’m not a big water drinker, but I’ll never notice a difference in my skin quite like after you really drink those 8 glasses of water a day. That’s a ton of water, but everytime I force myself to do it, I wake up feeling so much better the next day. I’m a morning person for sure, like I’m mentally awake but my face takes a while to catch up. Water is the only thing that helps! BATF: Are there any places in the city you go to to get pampered? Teigen: I’m so freaking lazy, everywhere I go is right by my house! I go to Great Jones Spa. They do really, really awesome facials. I’m obsessed with extractions and they do great extractions there. BATF: Ok, I’m veering a little bit but I’m really curious – what’s your favorite John Legend song? Teigen: Right now honestly, I absolutely love Tonight (Best You Ever Had). I think it’s called demo-itis or something—when you fall in love with the first version of the song that you hear before the studio produces it to make it radio-friendly—but I really adore the regular, acoustic version of Everybody Knows. And his song, This Time, the one where he’s just on the piano. I really fall in love with those first piano versions before anyone messes with them. And I’m so sad I don’t get to have them on the CD! It’s so funny because I remember telling [John] when Green Light came out, his biggest single ever, I was like ‘Oh. Yeah. This is not gonna go anywhere.’ I just thought it sounded ‘not him’ to me for some reason? And then it was his biggest song. He got a freakin award for it. And now he doesn’t trust me with anything…but…I still think I have good taste [laughs]. 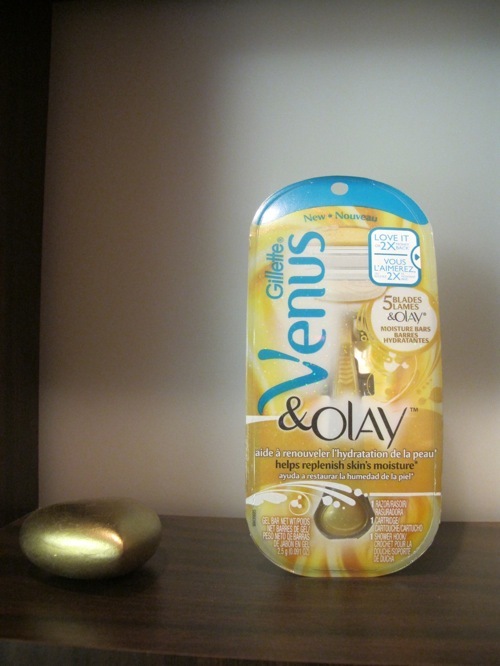 The new Venus & Olay razor! BATF: Finally, what does it mean to you to be Venus’ new spokeswoman? Teigen: This sounds so cheesy, but we [as models] truly are presented with a lot of stuff that I don’t buy or believe in. I would feel stupid talking about something I don’t love. I’m just the type of person that you can tell if I love something, and if I don’t, it comes off very fake. First of all, these are not only the most amazing group of women to work with ever (which is very important to me because I don’t get to work with a lot of women—everything I do is devoted to men! ), but this truly is a product I love and believe in. 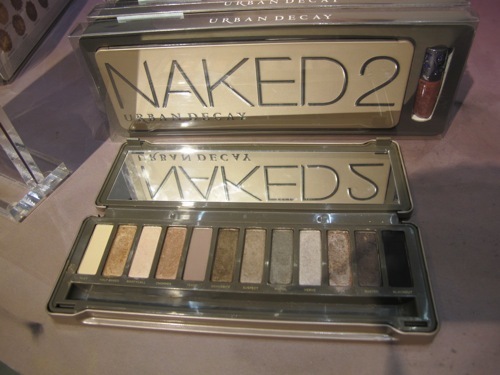 I really use it, I really love it. I love everyone who’s involved with it. It feels like a family – I get engaged, I get flowers from Venus! I really am happy to represent them. Thanks to Chrissy for taking the time for such a wonderful interview! You can follow Chrissy on her hilarious Twitter rants at @ChrissyTeigen, and be sure to check our her blog, So Delushious!. The Venus & Olay razor is the first ever beauty partner of the Sports Illustrated 2012 Swimsuit issue! The razor will be available for purchase starting March 15 for $10, but you can join in on the pre-sale on Facebook HERE. To Get The Look: Start with dry hair and use a small amount of Wella Professionals Natural Volume Styling Mousse at the roots. Set hair in steam hot rollers by rolling hair straight back from the head. This will give hair extra texture and curl. Use smaller rollers at the back of the head to create a tighter curl, and then pin hair underneath into a faux bob. Lightly mist with Wella Professionals Dynamic Fix 45 Second Crafting Spray, then back comb and tease at the root. Brush out the finger waves into place and set with Wella Professionals Stay Essential Finishing Spray. To Get The Look: Start out by prepping wet hair with Wella Professionals Velvet Amplifier to prime hair for a smooth blowout. Use a small amount of Wella Professionals Mirror Polish Shine Serum on the ends of the hair for added smoothness and shine. Blow out with a round brush at the roots for texture and use a Mason Pearson paddle brush to blow dry from mid-length to the ends. Back comb for extra volume, especially at the roots, and use a flat brush from mid-length to ends again so there is texture, but not curl. Then leave the front and sides of the hair out, pull the rest of the hair into a ponytail near the top of the back of the head. Smooth the hair left out of the ponytail back and wrap around the elastic to hide the band. Spray the style with Wella Professionals Stay Essential Finishing Spray to hold in place while leaving it with lots of natural movement. To Get The Look: First, apply Wella Professionals Pearl Styler to wet hair and rough dry it, using your hand and a blow dryer. This will give hair extra texture before styling. Next, gather hair at the crown of the head and secure with a bungee cord. You can tease the ends to rough it up a bit more, for added edgy texture. Loosely twisted the hair around the bungee for a loose structure and secure with bobby pins and hair pins. To finish, spray the hair with Wella Professionals Dynamic Fix hairspray, and rough up the hair with fingers at the root and around the bun, spraying once again with the Dynamic Fix to add sheen and hold the look for the night. To Get The Look: First, spray Wella Professionals Ocean Spritz all over and scrunch hair for a nice beachy texture. Loosely gather the hair into a slightly messy ponytail with a center part. Then, begin your fishtail braid. Once done, pull a couple pieces out to create a more distressed look and finish with a shine spray, such as Wella Professionals Shimmer Delight all over for a polished finish. For the latest on hair trends and styling tips, follow Wella Professionals on Facebook and Twitter! Try on all of these Oscars hairstyles in Daily Makeover’s Makeover Studio! 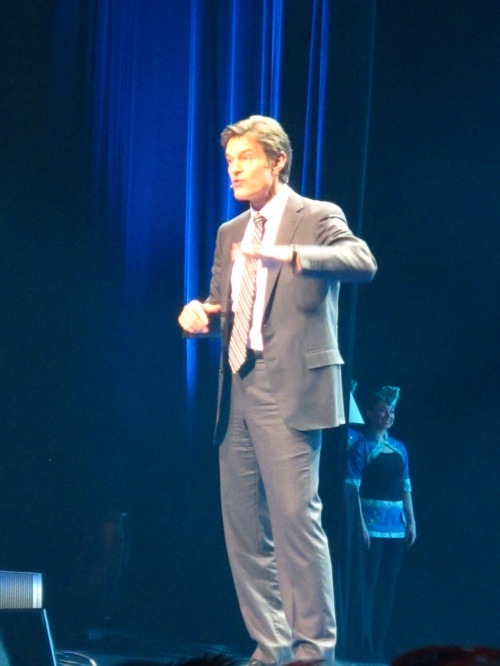 This past weekend, I attended Dr. Oz‘s Health and Happiness Summit at Radio City Music Hall. The event featured renowned nutrition, fitness, and health experts who spoke on each of his or her areas of expertise about where health and happiness meet. That included tips on losing weight, improving one’s skin, eating healthier or getting better sleep. – According to Dr. Michael Breus (aka The Sleep Doctor), your brain is most active during REM sleep…sometimes even more than when you’re awake. – 75% of adults frequently have a sleep problem, such as waking during the night. – Almost 50% of people snore. – There are 88 clinical sleep disorder. – 70 million Americans suffer from a sleep problem. – With good sleep, you can (surprise) lose weight too. Dr. Breus did a study with Glamour in which they changed nothing in the participants habits expect that they got more sleep. Over a period of 10 weeks, participants lost 3-15 pounds each! – With 8 hours of sleep, you can look 3 years younger. When you don’t get enough sleep, it causes puffy eyes, dark circles and lifeless skin color. – For better sleep, take your vitamins! Vitamin B3 increases effectiveness of tryptophan and lengthens REM sleep. Vitamin B6 is required for serotonin production (the calming hormone), and B12 helps sustain a normal sleep pattern. Foods rich in vitamin B are whole grains, cereal, nuts, broccoli, an potatoes. Foods rich in trytophan include whole grains, dairy, meat, eggs, broccoli, and asparagus. – According to Dr. Rovina Brock (Dr. Ro), 72% of Americans are overweight or obese; 1 in 3 kids are overweight or obese. – “Change the way you think about food” Dr. Ro suggests your plate to have 50% veggies, 25% lean protein, 25% whole grains. – Fiber and water are the key to weight loss. It revs up metabolism. Dr. Ro said you should be drinking half your body weight in water daily! – Dr. Ro also suggests drinking 2 to 3 cups of dandelion root tea everyday to help with weight loss. It helps burn fat 25% faster. – The common denominator in many diseases (diabetes, heart disease, cancer) is inflammation. The foods you eat and your lifestyle choices causes much of this. – Watercress salad is a natural dieuretic (and it makes skin to glow!). Dr. Perricone also recommends salmon for protein, & blueberries as excellent antioxidants/anti-inflammatories. – Don’t give up chocolate! Look for bars with high cocoa content (about 70% cocoa, and less sugar/fat). It has catacins that decrease inflammation and protects your heart and brain. – In a recent study, researchers took people who were diagnosed with depression and gave half of them prescription drugs. The other half were only given salmon and fish oil supplements every day. At the end of the study, the group who took the omega 3 fish oil supplements showed even more alleviated signs of their depression than those who took the prescription drugs. – Most people have no idea that the air inside your home is 3 times more polluted than air outside from even the most polluted cities like NYC (!). This is caused from air fresheners, fragrances, cleaning supplies, etc. The simplest solution? Crack a window. – You control over 70% of how well you live. How? Keep your blood pressure in check (ideal 115/75), don’t smoke, exercise at least 30 minutes daily, incorporate a healthy diet that’s easy to love, and keep stress under control. – Dr. Oz. – Your ideal waist size should be less than your height divided by 2. – Dr. Oz. – Another reason to keep that waist trim: a big belly puts pressure on kidneys and hurts the liver. – Half an hour before meal, Dr. Oz recommends eating a handful of nuts. It helps control hunger. 1. Three Good Things: keep a personal “Gratitude Journal,” and at the end of every day, write down three good things that happened to you, and why. 2. Make a Gratitude Visit: write a thank-you testimonial message to someone who positively affected your life, and deliver the message to them. 3. Discover your Signature Strengths: and use them in a new way. 4. Put Compassion into Action: through your personal acts of kindness. 5. Savor the Beauty of Little Things: and feel the joy of simple pleasures. 6. Nurture Your Social Bonds: give priority to close relationships. 7. Get Moving: at least 30 minutes of moderate intensity physical activity on most days of the week. •	Base your diet on a foundation of a rich variety of many different vegetables and fruits – – especially in their unprocessed states. •	Include healthy carbohydrates from whole grains; and healthy fats and protein from foods like fish, beans, and nuts. •	Minimize saturated and trans fats, sodium, processed foods, added sugars and cholesterol in your diet. •	Be mindful of your calories-in and calories-out, to work toward a healthy body weight. •	Don’t skip meals, starve yourself or go on fad diets. 9. Think Positive: cultivate an optimistic mindset. Project happiness: you can sometimes “act” yourself into a happier frame of mind. •	Find positive meaning in adversity. •	Find positive meaning in ordinary events. •	Find positive meaning in compassionately helping others. •	Find positive meaning by feeling gratitude for simple things. 11. Realize that enduring happiness doesn’t come from material success alone. People adapt to changing circumstances—even to wealth or a disability. Thus, wealth is like health: its utter absence breeds misery, but having it (or any circumstance we long for) doesn’t guarantee happiness. 12. Stay in the Flow Zone: seek work and leisure that engages your skills. 13. Take time to recharge yourself: Give your body the sleep it wants. Happy people live active vigorous lives yet reserve time for renewing sleep and solitude. Many people suffer from a sleep debt, with resulting fatigue and gloomy moods. 14. Nurture your spiritual self: if you’re so inclined. 15. Learn to Let Go: practice forgiveness and letting go of anger. 17. Realize that the key to happiness lies within you: in your own intentional activity, in what you do and how you think. Hope you guys found some of these tips/quotes helpful!! 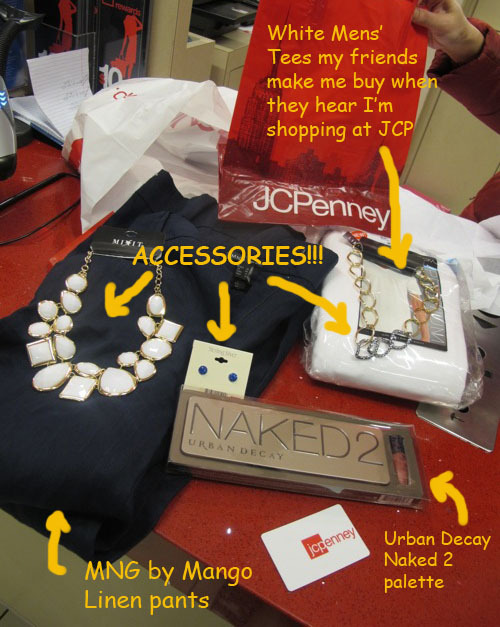 So this is going to be a little different from my usual posts, but recently, JCPenney approached me to discover their “new shopping experience.” That includes a completely new look and feel to their store, including “fair and square” pricing year-round. 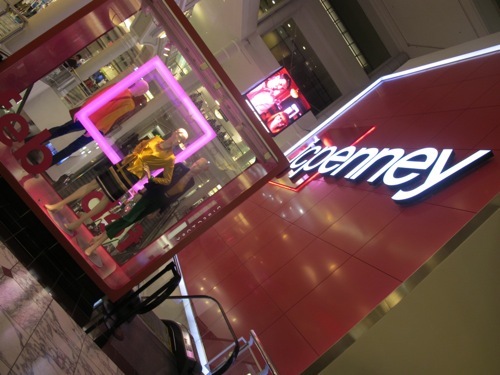 In fact, Forbes published a whole piece on how JCPenney will be the Most Interesting Retailer of 2012. “[They’re] implementing a new pricing strategy,” the article says, “slashing prices up to 40% with to keep them that way year round.” And PS, did you guys catch Ellen’s JCPenney commercials during the Oscars last night? HILARIOUS. Check out the outtakes from the commercials, if you haven’t yet! Anyway, I was given a $200 gift card to check it out for myself. I recruited my friend Afaaf to come along with me. Best.Decision.Ever. I think she was a stylist in another life. The first stop was the women’s department to update my wardrobe with some Spring-ready clothes. 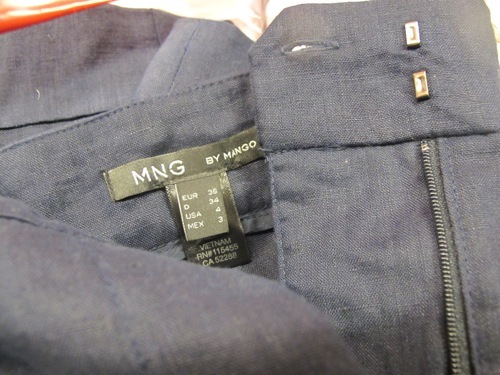 We found a fabulous pair of high-waisted navy blue linen pants from MNG by Mango that I fell in love with on first try. We moved on to the accessories department, where we spent the MOST time…we kept stumbling over most stunning cascading necklaces, drop earrings, cocktail rings. We both loved this white-plated necklace so much (“It’s one of those things that you know people will notice first,” Afaaf said). I got one for me and another for her and it’s one of my favorite pieces now. 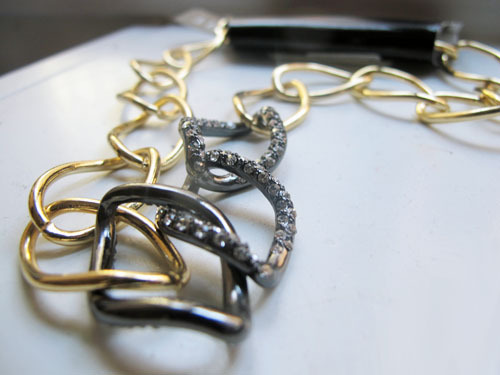 Afaaf also spotted this gold and gunmetal link necklace that would compliment so many outfits, I couldn’t leave without it. 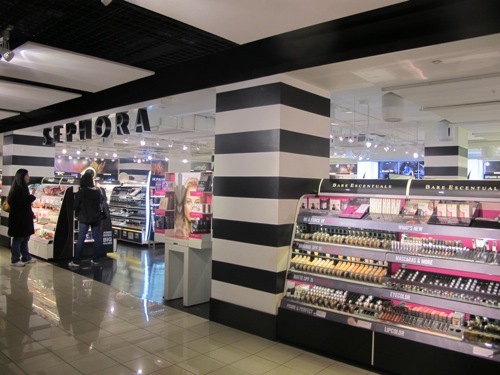 Finally, we spotted a Sephora and almost thought it was totally separate from JCPenney, but on of the employees told us our gift card was good for all their products too. By the end of it, we easily exhausted our gift card and went home with a bag full essentials (apparently that includes a pack of plain white-Ts my friends asked me to pick up from the men’s department). 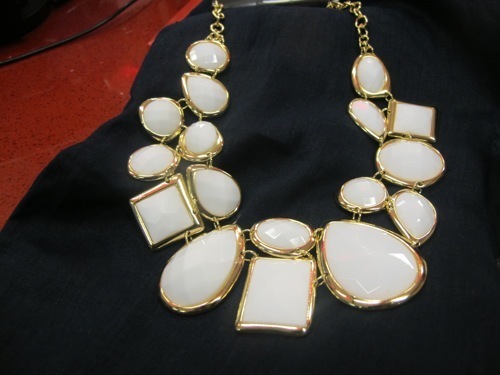 I rocked that white necklace the very next day! Has anyone else checked out the new JCPenney? What do you think? What would you have picked up if you got a gift card too? It’s Oscars night! How many of you will be tuning in? I had the pleasure of talking with Bruce Grayson, the Oscar’s Makeup Head, in NYC before he jetted off to LA for the makeup trials. Grayson has worked with some of the top celebs (Tom Cruise, Katie Holmes, Brooke Shields, Kate Walsh, Denzel Washington, the Clintons…to name a few), and he imparted some of his red carpet predictions and invaluable tips that I swear work (I know, because I’ve tried some of them I can’t go back now). Grayson's Oscar'd out Olay suite! When I met Grayson at a suite in the Thompson hotel, he was re-creating one of his favorite looks from the Globes. 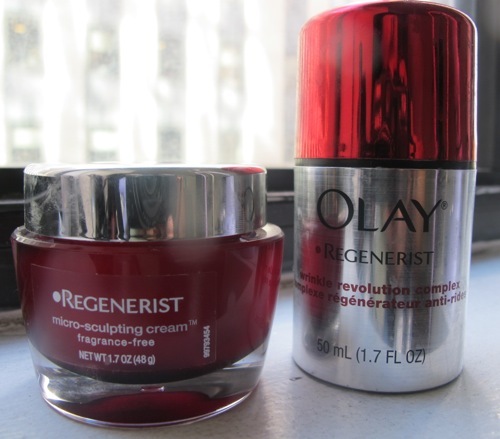 Grayson, an Olay spokesperson, showed me the tools in his kit to prep the skin, and his favorite go-to’s are Olay Regenerist Micro Sculpting Cream and the Regenerist Wrinkle Revolution Complex. I watched Grayson as he massaged the Micro Sculpting Cream in first and THEN the Wrinkle Revolution Complex. And when I say massage, I don’t mean that he just patted it on the skin and went on. He stood there and really worked it in the model’s skin, and I could actually her skin firm up right in front of me (she had beautiful skin to begin with, I’m not going to lie, but it was glowing after he massaged the creams in). The Regenerist Wrinkle Revolution works to relax and diffuse the lines, Grayson said. “Its optic-technology uses micro-fillers to fill in wrinkles for instant gratification.” Since watching Grayson do this, I’ve been using the two Olay products to massage into my skin before makeup and wow…it has seriously made all the difference. My skin not only feels softer but I’ve been going out more often makeup-less or using very little foundation (which is pretty much the point!). After moisturizer and before applying foundation, Grayson spritz a little Evian Water spray to add even more moisture to her face. He said the more hydrated the face is, the less makeup you will need to use. Grayson emphasized not to forget, that “texture is a game-changer.” For makeup to go on smoothly the skin’s texture needs to be extra-smooth (read: that it also doesn’t have any hair…try Olay’s Smooth Finish Hair Removal Duo which is gentle enough for the face…ask me, I know ;)). Grayson literally used only two drops of Giorgio Armani Luminous Silk Foundation, and used a brush to start in the center of the model’s face and buffed it out towards the cheeks and outer areas of the face. He then used a little of Laura Mercier’s Tinted Moisturizer on her cheeks to just perfect the color. I was shocked at how little foundation he was actually using. I asked about the red carpet and if he’ll uses more than that for the big day. The only thing he said he would add is a little more concealer if needed. 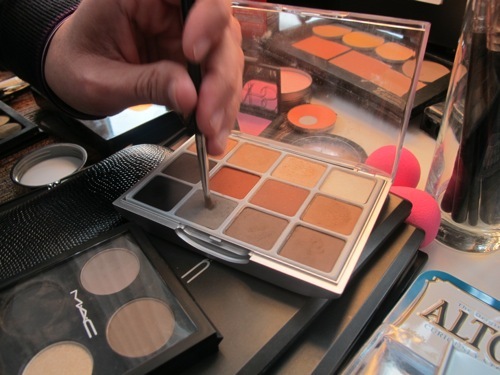 To apply, he wets his favorite makeup applicator, the BeautyBlender, with a little Bobbi Brown concealer (using this handy palette). 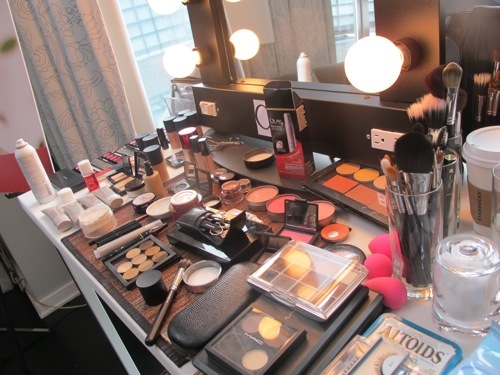 “I’m against using concealer unless you absolutely need to. And I definitely won’t use primer if it’s going to be a long day,” since he said the makeup will slide off too soon (it’s best for shorter days, or quick photo shoots!). Finally Grayson used Olay’s Regenerist Anti-Aging Eye Roller around the eyes before adding a little concealer to perfect the eye area (he recommends just one shade lighter to brighten up this area — don’t go too light!). 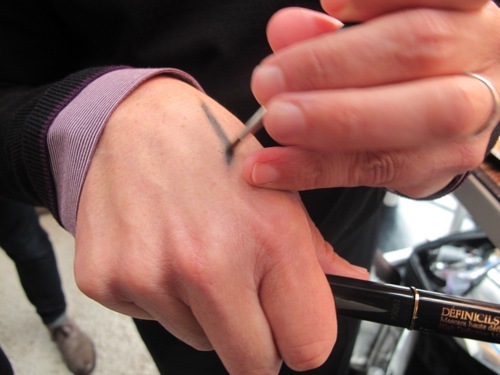 I asked him about how Angelina Jolie always has that perfect smoked out liner, and he pulled out a liner brush to show it right one me: First, use a flat brush and a gel liner to just touch the the liner against the lashes. 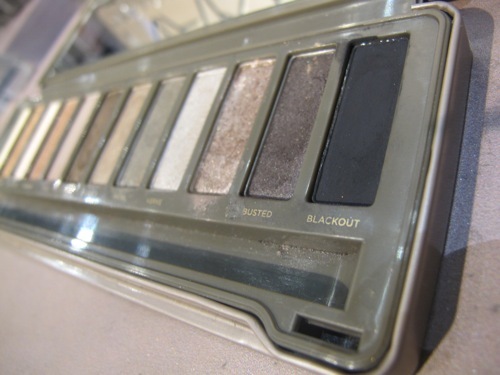 The, use a gray shadow to go over the black for a subtle smoked out effect. I guess we’ll have to see tonight! The Oscars are scheduled to air tonight on ABC 7e/4p. Sometimes great restaurant finds start with Groupon. *Not that we just asked you guys to come along because you had a car, I’m just saying. 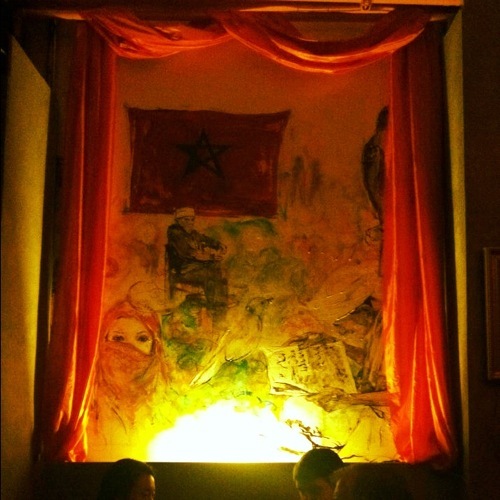 Draping curtains, dim lighting, and sketchings on the wall, and even one table sitting on a loft overlooking the restaurant, I was pretty taken at how much character was in such a small space. 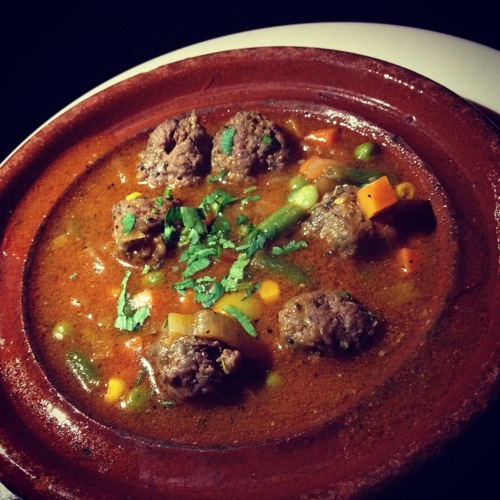 We ended up eating family style: two orders of feta cheese and spinach triangles, lamb shank tajine, chicken tajine, kofta tajine and chicken kabob. 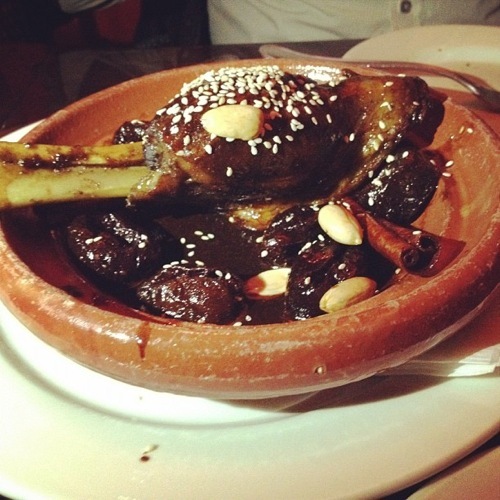 Everything was good, but I though the lamb shank tajine (lamb confit with prunes, almonds, and sesame seeds) was the superstar. I also never been that big on chicken tajine (the taste sort of falls a little flat for me), but having mixing it with the bed of seasoned chickpeas helped give it a little more flavor. 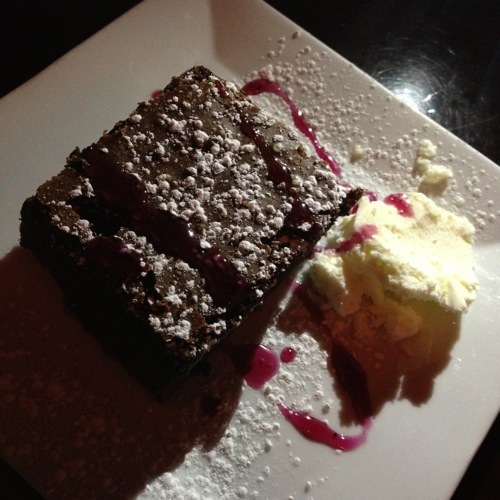 Oh, and my favorite part: dessert…or brownie a la mode. It was serious. 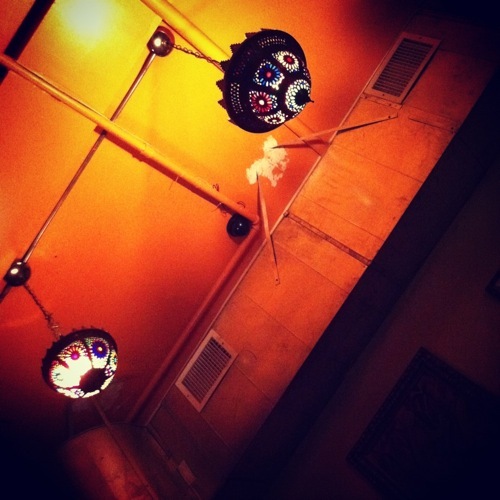 Kiosk also has an assortment of hookahs, so we dabbled with a chocolate mint flavored one. It ended up being a really fun, relaxing night. And for 6 people, shelling out only $15 (including tip) a person was not bad for a pretty varied three-course meal. Thank you, Groupon (and Asma :)). Occasion: An excuse to go uptown so we could use a Groupon before it expired. Truth.